Push the sticks into the apples and set aside. Clip a candy thermometer to the side of a heavy bottomed 4-quart saucepan. Add the Earth Balance to the saucepan and melt. Add the other remaining ingredients and bring to a low boil. Keep at a low boil, stirring frequently (every 5-10 minutes) for about 1 to 1½ hours until your caramel reaches 240 degrees. Remove from the heat and carefully stir in the vanilla extract. Allow the caramel to cool slightly until it has thickened a bit, about 15-20 minutes. Meanwhile, crush the Enjoy Life Foods Vanilla Honey Graham Crunchy Cookies in a food processor until they are fine crumbs. Set aside. Melt the Enjoy Life Foods Dark Chocolate Morsels with the 2 t. oil and set aside. Place the apples on a piece of parchment paper and prepare to dunk! Roll them first in the caramel (you can also dip them twice in the caramel, just be sure to allow them to dry about 15 minutes between coats), allowing extra to drip off. Then roll them in the crushed cookies. Allow this to dry and set while you finish rolling and coating the remaining cookies. 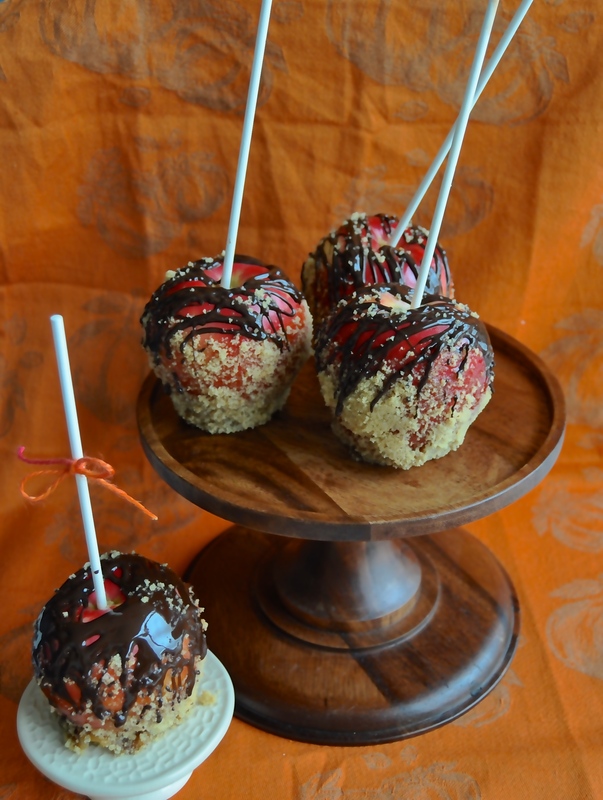 Finally, drizzle the chocolate all over the tops of the apples. Store in the refrigerator until ready to eat.